This is a 2019 Grady-White Marlin 300 Walkaround Cabin powered by twin White Yamaha F300 CLP Digital Motors.  Options include Seaport Blue Gel Coat Colored Hull Sides, Air Conditioning/Heat in cabin, TV-19" Flat Screen w/ DVD Player, Cabin Rod Racks, Bow Thruster, Command Elite Helm Chair (Stbd), Companion Bench Seat( Port), Hot Water Cockpit Shower, 15' Outriggers w/ Crank Adjust, Underwater Lights and More! This Walkaround Cabin Boat is in-stock and available for showings today. We Are Open 7 Days A Week For Your Convenience, So Call Or Stop By Today For A Quote.